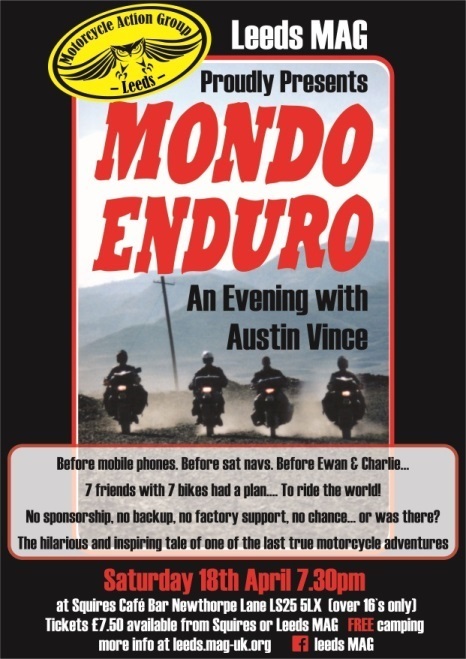 Join us at Squires Cafe on 18th April 2015 at 7.30 for an evening with Austin Vince. FREE camping! Before mobile phones. Before sat navs. Before Ewan & Charlie. 7 friends with 7 bikes had a plan… To ride the world! No sponsorship, no backup, no factory support, no chance… or was there? Tickets available in advance or on the door from Squires for £7.50. Over 16s only.